Some of them, like Christophe Cricket and Gaston Grasshopper, feel that the bird should be left alone as it could later pose a threat to them. 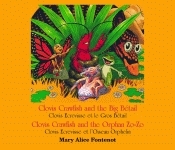 But Clovis Crawfish feels the situation is similar to that in the mythic tale of Androcles the lion: when the “poor thing” grows up, it might eat them—yet Clovis feels that the orphaned bird needs their help badly and that they cannot let it die. Clovis states his case well, and soon all the bayou friends are working together to feed and take care of Zo-Zo. But when Zo-Zo dramatically shows everyone that he is ready to fend for himself, Clovis takes the necessary steps to send him on his way. 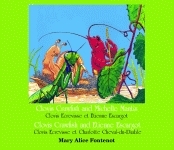 Author Mary Alice Fontenot opens her young readers to the miraculous world of nature, acquaints them with some common French phrases which punctuate the various characters’ speech, and teaches a worthwhile lesson. Eric Vincent, artist and resident of Louisiana, has captured the essence of the charming bayou creatures in a style that complements the whimsical text. 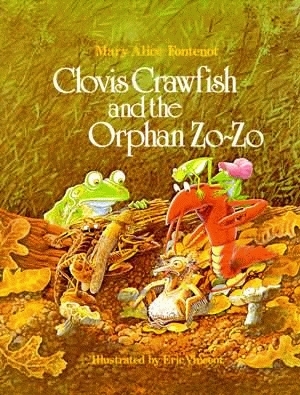 He is also the illustrator of Clovis Crawfish and the Singing Cigales.